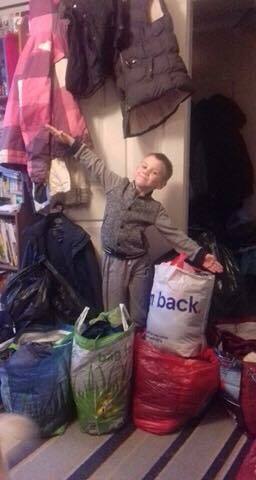 7 year old Owen, collects Coats4Calais! We love all our donors who have helped us collect coats for our winter appeal, but today we lost a little bit of our hearts to Owen. Owen is 7 years old and desperately wants to go over to help refugees himself, but he’s too young, so he sent out appeals on social media and asked his friends to give any coats or warm clothes they no longer need after Christmas when many of them have new ones to wear. The 42 coats collected, along with hats, scarves, gloves, and jumpers, are on their way to us. Owen says he feels really good having collected so many coats to help people. He hopes it will help everyone who has been running away from anything bad, especially children. Thank you Owen, to you, your family and friends. You are a star.